"Ma, what is that thundering sound? ", Obi was pulling my hand as we crossed the street from the parking lot. "That's the Falls, dek" answered Bo, my son. 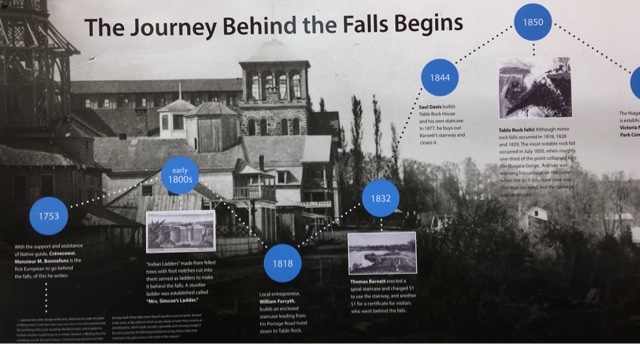 "So we will see the Falls now? This close? Can we swim as well there ? Obi bombarded me with questions as we got closer. No, dek. You can not! 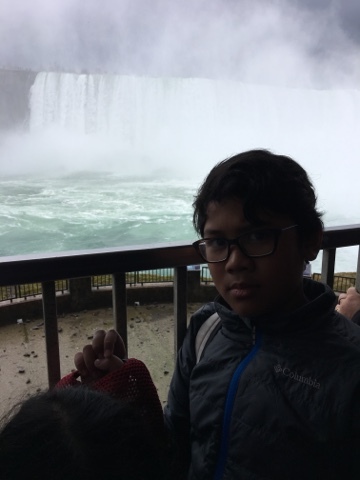 The Falls is so huge and there are millions of cubic of water falling in seconds" claimed Bo, who definitely was reading the booklet we got from the Park's officer. As Bo finished explaining that, we saw the source of the thundering sound. Welcome to Horseshoe Falls, Niagara, Ontaria, Canada. By the time I wrote this story, I was in Saint Vincent and the Grenadines, missing my munchkins, attending one of the Seminars held by the UN. I started drafting my 5-day experience in St. Vincent and the Grenadines, when I just realized that I had another draft to finish :). Well, stopping in many cities and enjoying so many attractions along the way do provide me with endless stories and interesting notes. And here I am, bogged down with my own drafts :). So allow me to get back to our spring break road trip. 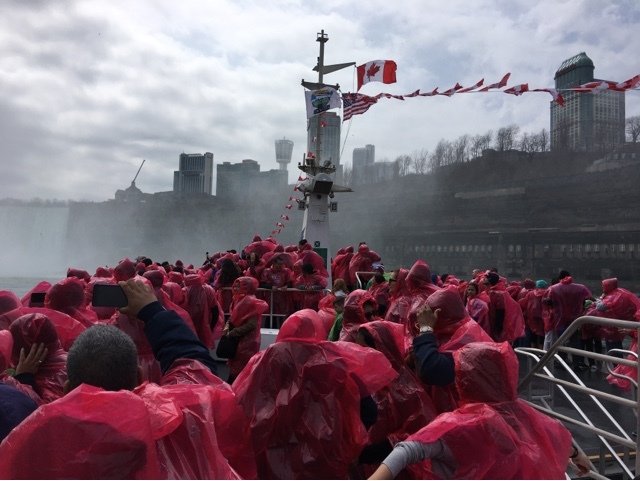 We just arrived at Niagara Park, so ready to see the magnificent Horseshoe falls, the Niagara Falls in Ontario, Canada. 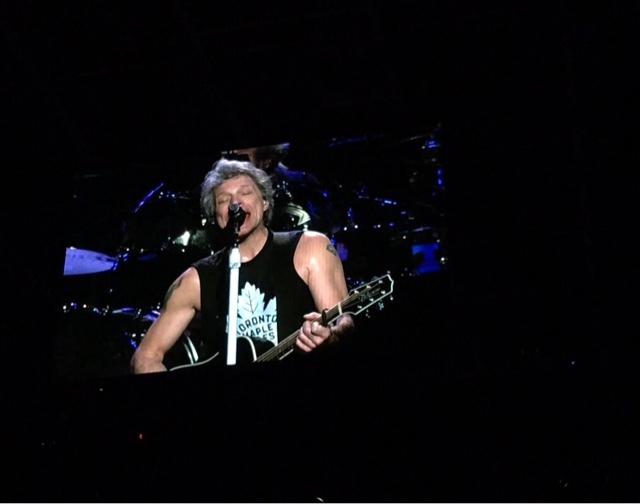 After driving approximately 4 hours, straight from Bon Jovi - This House is not for sale concert at Air Canada Center, Toronto (yes, I know.. I will share that as well later >_<), we arrived at around 1 AM in the morning at the hotel. Directly headed to our room, we had good sleep indeed so that we can enjoy the thundering Niagara Falls, Ontario, Canada, the day after. Here's the short videos of one of the hits Jon sang for us in Toronto. 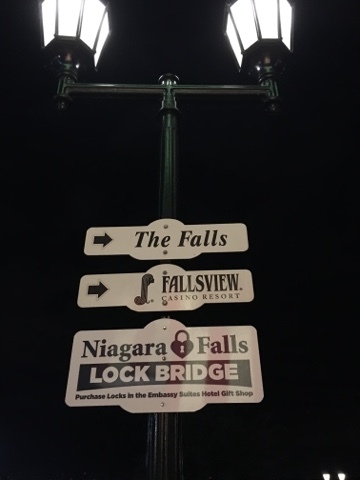 We stayed at the Oakes Hotel overlooking the Falls during our visit. Waking up slightly late after our extremely long day at Toronto, we promised the kids that we would enjoy that day's trip like they wanted it. But Bo et Obi were happily chatty about the Bon Jovi concert, although obviously they were not familiar with the songs at all :)). After a hearty breakfast at Applebee's nearby, we headed directly to National Park Commission at Niagara Falls and ready to start our adventure! 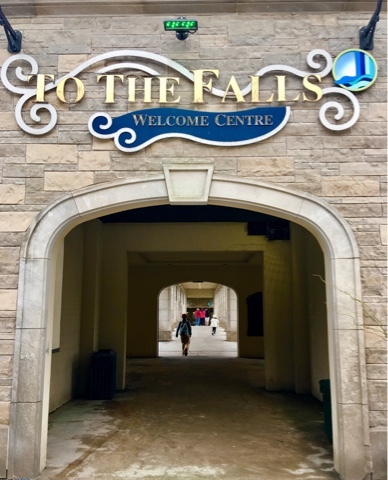 The plans were to spend the whole day at Table Rock, the area surrounding the Falls to see Horseshoe falls, the biggest Falls with obviously the shape as the name suggested. 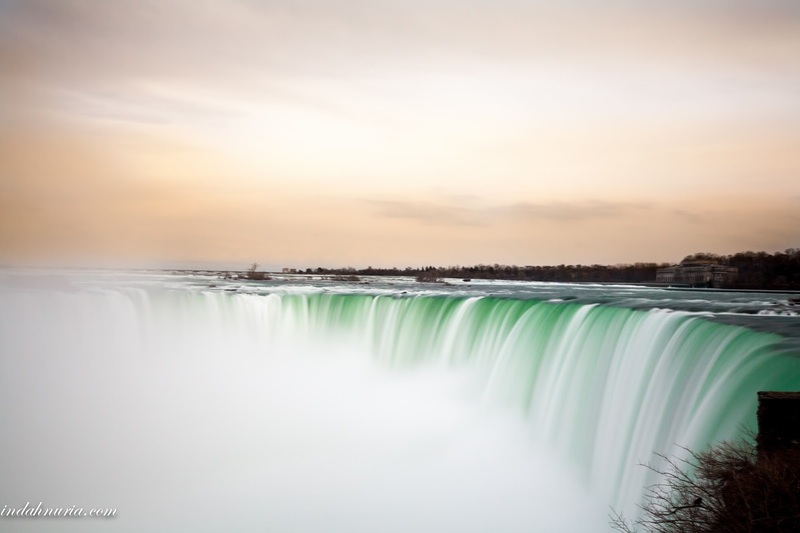 This, together with American Falls and Bridal Veils falls in the American side, is well known as Niagara Falls. As I said, we asked Bo et Obi decided what to do, as they had given me and my hubby a great time watching the concert a night before. 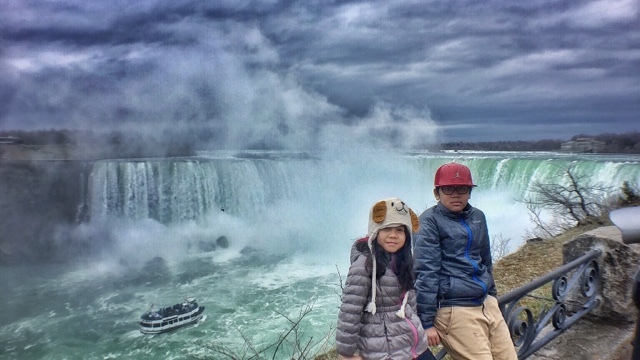 Apparently, besides ice cream lunch and swimming pool time, they both were eager to see the Falls and got on a cruise. 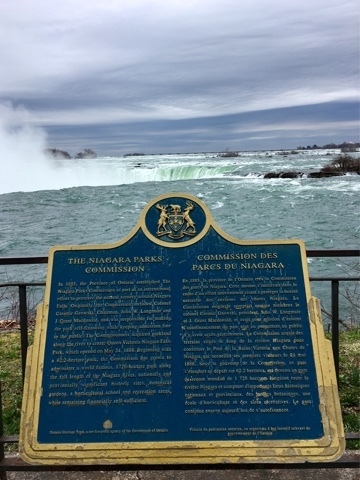 Table Rock is the area where you can see Horseshoe Falls from quite a close distance. Here we can just see the Falls and take pictures for free. When we arrived, it wasn't really packed with people. But I can imagine how it will be during the peak season. And the weather at that time was still a bit chilly, especially as we were so close to those millions of cubic of fresh, cold water. There are several choices and attractions that you can choose here. 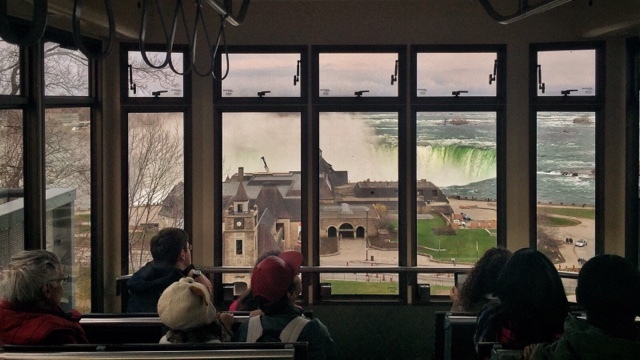 Some of them are the Journey Behind the Falls, Niagara Furry, White Water Walk, Floral Showhouse, Butterfly Conservatory, Horn Blower Cruise, Fort Eerie and more. You can have a package, including with WEGO Bus which will take you to those places, or you can pay the ticket separately. The package consists of classic (CAD 56.95 per adult, CAD 36.95 per kid) , nature (CAD 56.95 per adult, CAD 36.95 per kid) and plus one (CAD 90 per adult, CAD 59 per kids). As we didn't really plan to see everything, we only chose 2 and bought ticket separately. You can check NPC website for more accurate information. We chose the Journey Behind the Falls, where we walked around a tunnel underneath the Falls. The ticket is CAD We saw some pictures and stories about the Falls, including one incident that happened way in the past where one visitor, a boy, fell from the boat near the Falls but he survived. 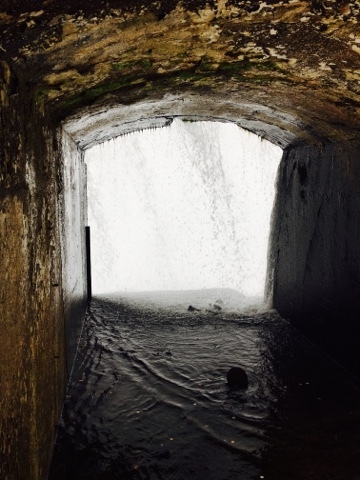 We walked under a wet tunnel, saw how it was built, and felt the thundering Falls right above our head. Some of the tunnels are closed but we do have one open which is so close to the Falls. Actually, there is a balcony with stunning view to the Falls, but too bad when we were there it was closed for renovation as many rocks were falling down to that balcony. Scary indeed! As close as we can get...the balcony is right behind it. After those two attractions and tons of photos, we went back to hotel, had late lunch, and came back when it was dark to see the light show. 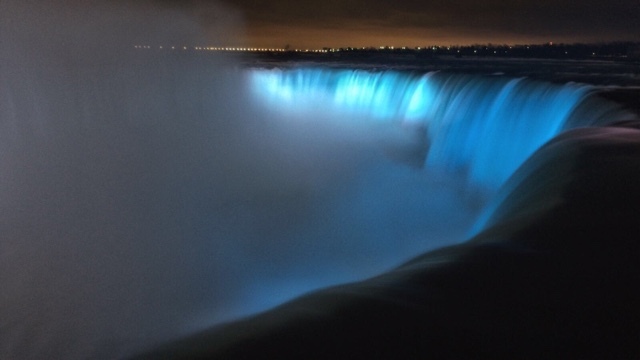 We heard the light show is something you CAN NOT miss when you are in the Canadian side of Niagara Falls. 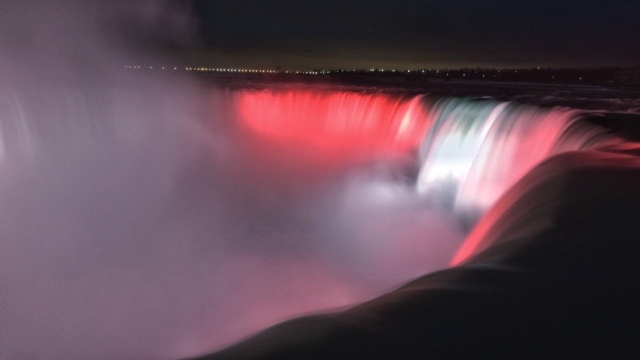 Yes, at night, you will see Horseshoe Falls in blue, red and white hues. 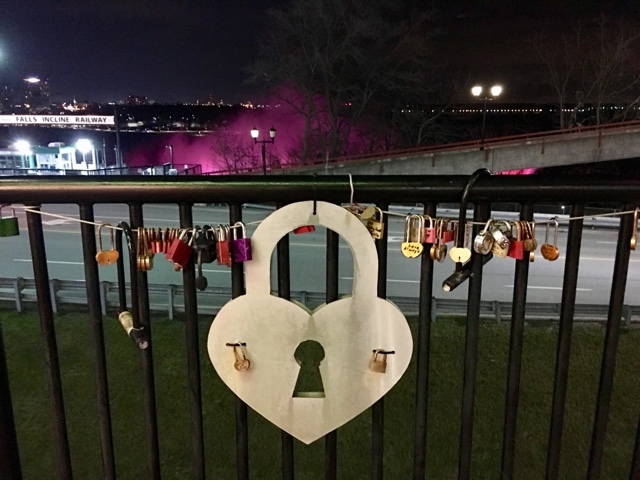 On our way back home that night, we came across Niagara Falls Lock Bridge, right behind TGIF restaurant where we had our dinner. If you drive, you will have to pay CAD 15 for parking while you're visiting the area. The parking lot is spacious but I bet it will be packed during the peak season. WEGO bus is one good option and you can get the pass together with the ticket for other attractions at the welcome center. Another thing that you use is the funicular. It takes you down directly to Table Rock welcome center and it happens to be right behind out hotel. The Oakes. The price for one trip is CAD 2.75 per person. Using the funiculaire from our hotel down to the Table Rock Welcome Center. 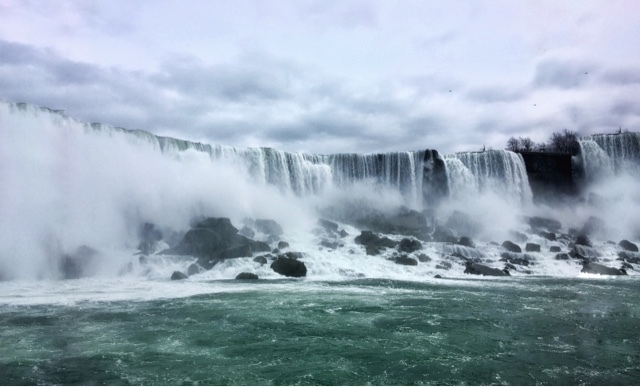 So, I hope you find this post beneficial, especially if you plan to go to witness the thundering Niagara Falls, Ontaria, Canada . We are also visiting the one on the US side and happy to share it on the next post. 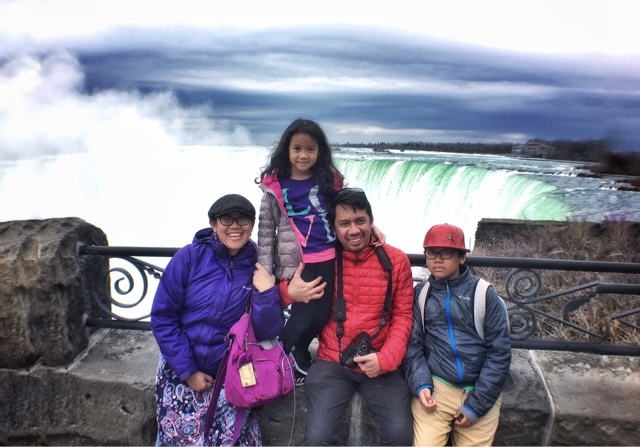 Enjoy Niagara Falls and till the next adventure :). Uuuh...saya takut sama air, mbak. apalagi yang deres kayak gini. nggak kebayang naik itu boat dan kena air yang curahannya guede. tapi kalau lihat dari tepi dan agak jauhan kayaknya berani. Bride Veil, namanya bagus ya. The falls are on my bucket list. What a sight!! Wow - magnificent! I can almost hear the roar of the water. that place is so epic! Indeed, Dezzy...happy to be here! Wow! What a trip you had. I can feel the strength of the water in your photos. One of the place that I want to see in real life! Thanks for sharing. The waterfall colors are just...WOW! I love the photos of your family! I remember getting soaked on the ferry ride too. Those ponchos are worthless lol. You took some really beautiful shots of the falls. Definitely one of my most memorable trips we've ever been on. Must-see Falls if we get a chance..
Pasti berkesan seumur hidup bisa naik kapal mendekat air terjunnya. warna warni waktu malamnya juga cakep ya kak. Gak kebayang gemuruh suaranya kayak apa, Mbak. Zaman kecil dulu mamaku selalu cerita kalau air terjun Niagara itu air terjun raksasa yang paling terkenal sejagat. Ini cantik pula bisa warna-warni gitu ya. Baru tahu. Tfs, Mbak.